Motley County Railway Company | The McKeen Motor Car Website Motley County Railway Company | The Compendium of Knowledge on the McKeen Motor Car Company, and their experiments. 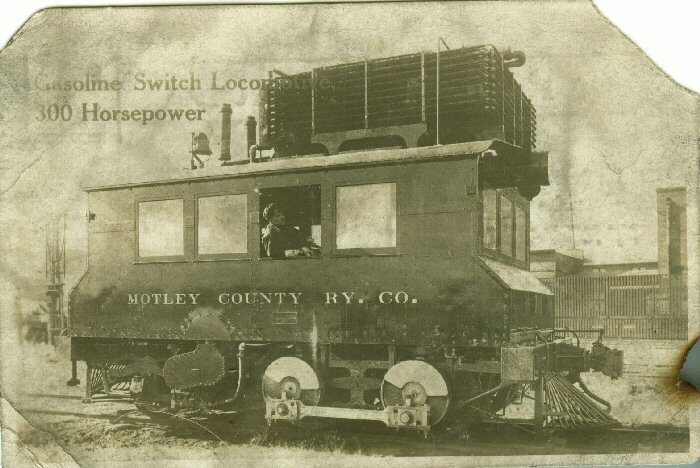 The McKeen Motor Car Co. had built a prototype gasoline switcher engine with a 300Hp engine and stored it in there sheds for a about a year or two before painting Motley County RY. CO. on the right side and on the left side and McKeen Locomotive. They also had plans to build a 500HP switcher, built nothing materialized. 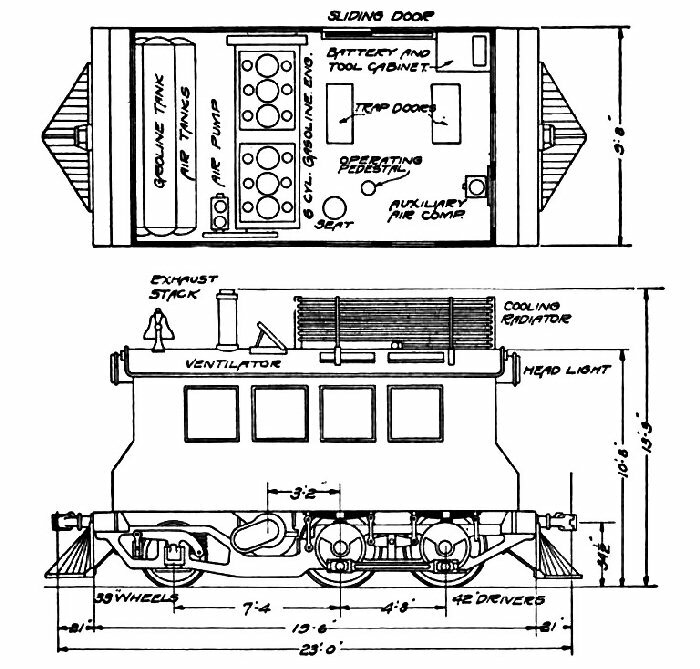 This is a diagram of the 300Hp switcher and below is of the never built 500Hp switcher. There has been a steady and rapid development, during the past three or four years, in the application of internal combustion engines using gasoline or kerosene as fuel to the driving of light locomotives. The early development was in the of locomotives for use for mining purposes and around industrial plants. These machines were of comparatively small size and power. Recently larger machines have been built, especially designed for switching service. From present appearances the time is near at hand, if indeed it is not already here, when the gasoline locomotive will displace the steam locomotive for switching purposes in very many places. True, the gasoline locomotive has not as yet attained such size and capacity that it can replace steam locomotives in the operation of a large city terminal yard. There is , however, an enormous amount of work done by switching locomotives around country stations and in yards and shops of manufacturing plants and other industries. If this work is to by steam locomotives, either a switching locomotive must be kept fired up all day to do perhaps not more than one or two hours’ work, or else the local freight train must be delayed so that its locomotive can do the work. Either of these plans are extremely costly for the amount of work done. Gasoline locomotives are now available which can do three-fourths or possibly nine-tenths of this work as well as a steam locomotive. The gasoline locomotive is always ready for use when it is needed, without the delay of getting up steam, and uses fuel only while it is at work. The fuel it uses, of course, far more costly than the coal burned by the steam locomotives, but the quantity it uses is so small that the actual fuel expense may be less than that of the steam locomotive. Of course, one great advantage of the gasoline locomotives over the steam locomotive for switching service is that it is a geared machine. Nearly all switching service is done at low speed, and ought to be done so to reduce damage to rolling stock. The wonder is that none of the steam locomotive has ever put on the market a tiered switching locomotives for late work, built in long lines of the present gasoline locomotive. A very large market might have been found for such a machine had it been developed. Certain features of advantage of the gasoline locomotives over the steam locomotives deserve a special emphasis. The first is that the engine driver on the gasoline locomotive has a much better opportunity to see what he’s doing and how the train is being handled, since he looks directly out of time it from the cab and does not have his vision interfere with boiler or the tender or clouds of escaping steam, as happens very often in steam switching service. Again, in the operation of these locomotives, the firemen is, of course, dispensed with, making a large savings in running expenses. Still farther, as escaping smoke and steam and the noise of exhaust are eliminated, the machines can be operated in places where a steam locomotive would give rise to perpetual compliant threats of damage suits or injunctions. Turning out to gasoline locomotives actually on the market, we illustrate in Fig. 1 a 300-Hp. 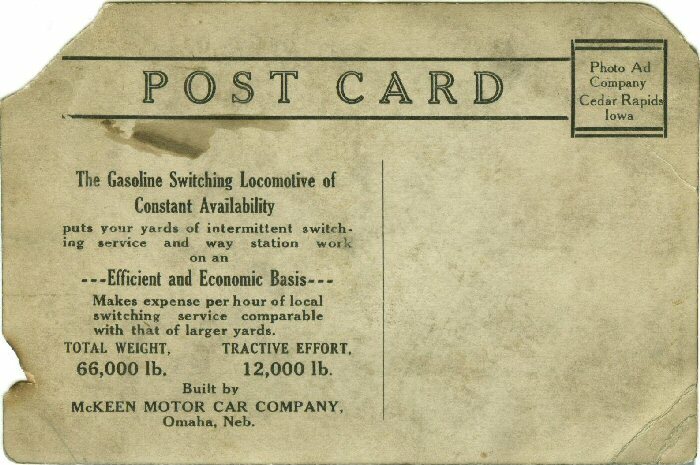 Gasoline locomotives recently built by the McKeen Motor Car Co., Of Omaha., Neb., For the Motley County RW. Of Texas. This machine is now in use in freight and switching service between Running Springs junction on the Quanah, Acme & Pacific Ry. And of the town of Matador, Tex. As showing its capability for road service, it is interesting to note that the machine made the trip from Omaha to its destination under its own power. The locomotive has the total weight of 66,000 pounds., Of which is 16,000 pounds is on the four driving wheels. The gasoline engine used is a six cylinder machine, the cylinders being 11 inch in diameter and 15 inch stroke, corresponding in general designed to the engines used on the McKeen Motor Cars, built by the same company. The general arrangement of machinery is shown in Fig. 2, which, however, is a plan of the machinery used on a locomotive of 500 HP., For which the McKeen Co. Has made the designs but which has not yet been built. From the center of the crankshaft Morse chain drive rotates a sleeve which turns freely on the rear driving axle. A multiple-disk friction clutch on the axle permit when the sleeves to rotate freely when the clutch is disengaged, or puts it in connection with a sprocket driving in Morse chain sprocket on the front drive axle. The clutch on the latter path enables the engine to either deliver power directly to the driving wheels or to drive them through a series of speed-reducing gears, the latter being used, of course, when the locomotive is starting a train or hauling heavy loads. When in low gear, and running at a speed of 6 miles per hour, the 300 horsepower locomotives is designed to produce a pull-bar of 12000 pounds. The clutch is operated by compressed air, supplied by the two cylinder 5in. Air compressor driven from the engine crankshaft, which also furnishes air supply for the brakes. There is also provided an auxiliary air compressor in the cab for emergency service. A notable feature is the herringbone gears are used, giving great strength to withstand the shocks of service. The water circulated from the cylinder jackets is cool by the tubular radiator seen on the roof of the engine cab, which has 3600 sq. ft. of cooling surface. On high gear, The locomotive travels at 16 miles per hour and then running at 350 R.P.M. Mr. McKeen has also designed a gasoline locomotive of 500 HP., The general construction being similar to that of the 300 H.P. 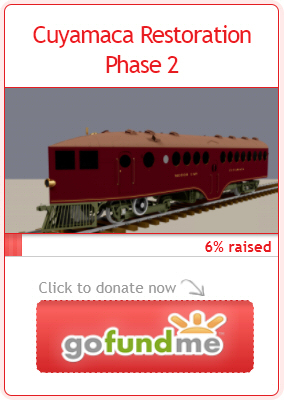 Locomotive here with illustrated, all parts being enlarged in proportion to the increased work. While this 500H.P locomotive has not yet been constructed, gas-electric locomotive smaller nominal power but greater hauling capacity has been built by the General Electric Co. for the St. Paul, Rochester & Dubuque Electric Traction Co. Of theaters in the service between Minneapolis in Northfield, Minn. This locomotive has two 8-cylinder gasoline engines of this type used on General Electric motor cars. Each of these units drives an electric generator supplying current to electric motors mounted on each of the four axles of the locomotives. A total weight of this machine is 114,000 lb. and it has claimed to have a maximum draw-bar of 30,000 lb. The engines are rated at about 100HP. The cost of this machine, with its necessarily expensive electrical equipment, is doubtless considerably greater than that of the McKeen machine, with its straight mechanical gear. 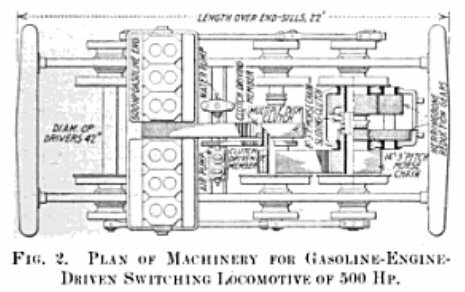 Gasoline switching locomotives built Baldwin Locomotive Works, and having speed-reducing gears similar in general design to those used on automobiles, were described by A. H. Ehle, manager of the gasoline locomotive department of the company, a paper read before the Society of Automobile Engineers, at its annual convention in New York on Jan. 7. The heaviest of these locomotives is a machine weighting 18 tons, capable of developing a draw-bar pull of 6000 lb. According to Mr. Ehle, one of these machines built for the Kellogg Toasted Corn Flakes Co., A recent test exceeded its guaranteed draw-bar polled by about 50% and when operating on either gasoline or kerosene. The fuel consumption was found to be about 4 1/4 Gal. per hr. When hauling a train of 80 tons back and forth over a track having level stretches and the grades as high as 3%, the engine running on the low gear. These illustrations are sufficient to show the rapid development of the gasoline switching locomotive for commercial purposes and the possibilities of its use for lighter switching service and rail yards.